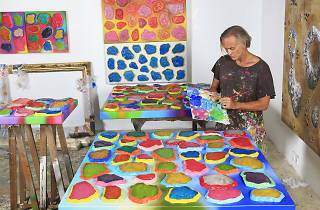 Born in Barbados and raised in Hawaii, Ashley Bickerton came to New York in 1982 and quickly became one of the stars of the conceptual art movement known as Neo-Geo. In 1993, however, Bickerton pulled up stakes and moved to Bali. There he changed his style, embracing figurative painting to create sharp parodies of island culture and the West’s tendency to romanticize it. 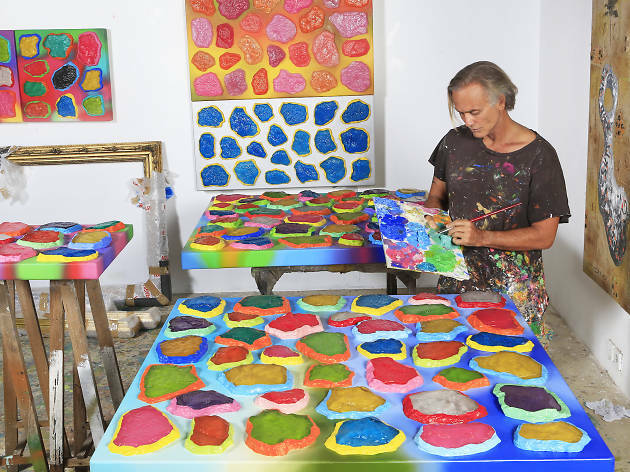 On the verge of the first U.S. survey of his 35-year career, at FLAG Art Foundation in Chelsea, the artist spoke to Time Out New York about how his peripatetic childhood shaped his work and why he left New York. Your father was a field linguist, so your family was constantly on the move. Do you think that affected your work? I think that’s been part of the work, yes. In a sense, I’ve always felt out of context, like I don’t belong anywhere, so I always think of myself as an outsider, and what I do reflects that. You seemed to quickly catch fire in the ’80s art world. What was it like being in New York City at that time? When I arrived here, I almost immediately started working for Jack Goldstein, who was a big deal in the Pictures Generation. So that gave me a direct conduit into the cultural mafia of the moment. Meanwhile, Neo-Expressionism had become this huge machine, demanding the lion’s share of the spotlight. When you’re a young artist, you tend to think of being in a situation of us versus them, so I moved consciously toward a cooler, more conceptual stance in reaction to Neo-Ex and graffiti art. In the East Village gallery scene back then, there were literally battle lines drawn across the alphabet avenues over all that. Looking back now, it seems quite silly. You’re still closely associated with Neo-Geo. What did you think of that label? [Gallery dealer] Jeffrey Deitch coined the term ironically. None of us involved—with one exception—liked it. I prefer the term Commodity Art, because that was what I was trying to zero in on at the time. So were artists like Haim Steinbach and Jeff Koons. They were taking commodities in their hermetically sealed, pristine state and freezing them there. It was like making a spiritual connection to consumer culture, which I found very interesting. Yet you left for Bali. Why? I wanted to start doing paintings, and it had gotten to the point where there were too many damn social obligations to do the harder studio work painting entails. So I had to get away. I grew up in the tropics, so I enjoy the weather. But Bali wasn’t important to what I was doing. I’ve never seen myself as one of those characters washing up on the beach with dreams of becoming [Paul] Gauguin. I came here like any artist who needs to get the hell out of New York and moves upstate. I moved upstate, only further. Ashley Bickerton’s survey is at FLAG Art Foundation Sat 23–Dec 16 (212-206-0220, flagartfoundation.org).